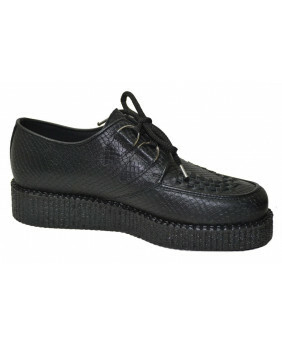 The Creepers shoe became popular in the United States and England in the 50's thanks to the Rockabilly movement. Since then, they have been declined in many finishes and thicknesses of compensated crepe soles, simple, double or triple to such an extent that Yves Saint Laurent put them back in the day in 2007. The Steelground brand has become a Creeper specialist with no less than 70 different models, very classic black suede leather or one-colored, with lace or metal buckle, either very offset with zebra or pink leopard finish, neon green two-tone , silver or snake imitation. Very comfortable, the insole is microfiber, the top of the Creepers at an incomparable price.